If you are the proud owner of an automatic garage door system, then you no doubt can attest to what a wonderful addition this type of device is with regards to the security and convenience of your home and daily routine. Unfortunately, like all other large electro-mechanical devices, the time must come when every garage door owner will experience some trouble with their automated system. No machine lasts forever – but with the right skill and experience, the lifespan of these systems can be significantly increased. This is where we come in. Out of all of the different moving parts of your system, the garage door springs are arguably the hardest working ones. These components are under a lot of stress on a daily basis, as they are in charge of supporting and counterbalancing the weight of the door panels. Spring replacement or adjustment can, therefore, be incredibly dangerous, as any mishandling will more than likely result in a serious injury being inflicted. Our technicians can perform this type of tasks without jeopardizing anyone's safety and wellbeing. The opener is the motorized device that provides the horsepower your garage door needs in order to move. Over time, this device and its various parts may begin to experience some issues. The rail system can rust or even break, the motor gear will eventually wear out and even the circuit board or the safety sensors can suffer from a malfunction. Our experts can expertly handle any of these issues. We'll repair anything wrong with the trolley, realign the safety sensors as necessary and replace the motor gear if it's unable to continue working properly. If someone accidentally backed into your garage door and you need to have some panels repaired or replaced, or one of your springs or cables needs to be adjusted, we're the team to call. 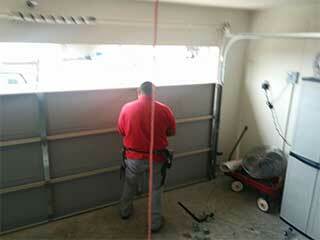 There is simply no problem our experts at Garage Door Repair Maple Valley can't take care of. Call us today for more information.